1. We can put our food recycling waste in any kind of plastic bag now, rather than having to buy the compostable ones. I know in other areas you can simply put it straight into the recycling bin, but sadly we can’t. This is at least a good way to use some of the plastic packaging that comes with everything. At least it’s being reused for something, rather than going straight to the rubbish bin. 2. My sourdough bread baking fever continues, albeit with fewer larger holes then I would like, but I’m going to go back to trying the second prove in the fridge overnight, and maybe doing a no-knead version, folding and stretching the dough instead. I asked Kat Goldin (sourdough baker extraordinare) about the secret to good holey SD and she said that you don’t want it too holey or the butter gets out! She’s my kind of girl. 3. This was my amazing Monday find. It kept me smiling broadly for at least another two days after that. You know when you pop into a charity shop, not really looking for anything in particular but just wandering? Well I turned away from the bookshelves and saw this beautiful cast-iron pot. It’s my favourite colour red and completely unmarked. I grabbed it as fast as I could, instinctively. I couldn’t see a price on it and didn’t want to put it down, (mine!) it was love at first sight. I asked the assistant how much it was and I nearly dropped it on both our feet when she located the label and told me it was £3. I’ve never moved to a till so speedily! It’s 24 cm across and the 28 cm version of this brand sells new for around £45. I’ve never come across such an amazing charity shop find. It’s pure treasure. I’ve already road-tested it by cooking a one pot chicken and rice thing on the hob and oven. It’s absolutely superb, what a bargain. Incidentally I’ve had my personal Facebook account since 2007, in that time I’ve posted all sorts of really important life events and celebrations. But do you know which post garnered the fastest likes/loves ever? Yep, it’s these pictures which I excitedly took when I put my treasure into the boot of the car. 4. Another find in another charity shop on the same day, not that I bought this, but my it brought back some memories. It’s just like a set my family had when I was very young. I have seen Kiln Craft on old TV sitcoms, but I don’t recall coming across a whole collection. This was priced much more realistically at £28 for the set. 5. A quick walk through the library and the cover of this book just jumped out at me, it made me chuckle. 6. I thought you’d like to see my Edenvale Cowl after blocking, it makes such a difference to lace. This weather is perfect for blocking and drying thick items. I’m really pleased with this knit. I did try it on and was thinking about doing a photo, but really it looked ridiculous as I was wearing a spaghetti strap top with bare arms! 7. Naughty, naughty Wednesday morning breakfast but these sourdough pancakes are delicious. I took the recipe from Tastes of Lizzy T blog. It’s good, too good. If you know what I mean. 8. A new lunchtime dish I made: it’s baba ganoush. You grill whole aubergines until the skin is blackened then scoop out and chop the soft flesh. 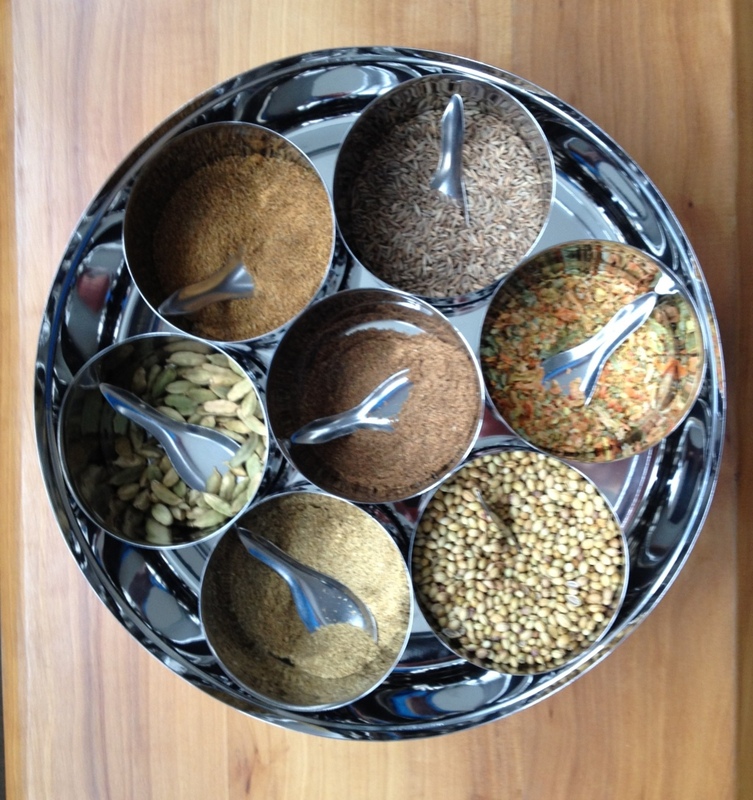 Mix with tahini, olive oil, lemon juice, garlic, salt and pepper. 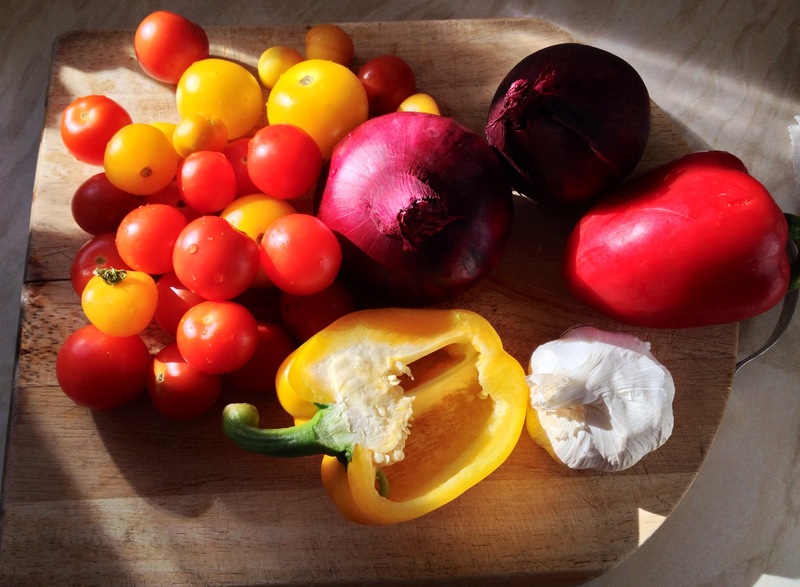 Delicious with toasted pitta or flatbread, a few olives and salad. The recipe is from Paul Hollywood’s Bread book which I’ve borrowed from a relative. It’s got a good range of bread recipes, and for each bread there is one for an accompanying dish. The photography is beautiful and I want to make a lot from it. The ingredients for salmon pate are on my shopping list for next week’s lunches. Needless to say I’ve added the book to my birthday wishlist. 9. A kilo of gooseberries picked from my Mother’s garden turned into my first ever batch of goosegog jam. I’m all about raspberry jam usually in summertime, but I’m glad I’ve made this because it is delicious, as you can see from the mere half remaining of one of the jars, after just a few days of opening. I’ve only eaten it once on two crumpets and it’s going down so quickly that I’ve grabbed another jar and put my initials all over the label! His and hers jam seems a good plan….! 10. Today I’ve baked my first loaves of bread in my 2lb tins for over a month. I’m now calling this doddly bread; as in it’s a doddle with commercial yeast. Does what it says on the tin! Unlike sourdough which dilly dallies. As the kitchen’s so warm, with our continuing high temps, the bread dough rose as fast as anything, sooo easy. Are you busy in the kitchen? Have you found any treasure lately? What’s made you laugh this week? This is a sweet little patch. I intend to buy two blank craft cards and envelopes and attach a heart patch to each using double sided sticky tape. Do they still use that all the time on Blue Peter? I’m going to send them to two little-ish girls for a Valentine’s surprise. 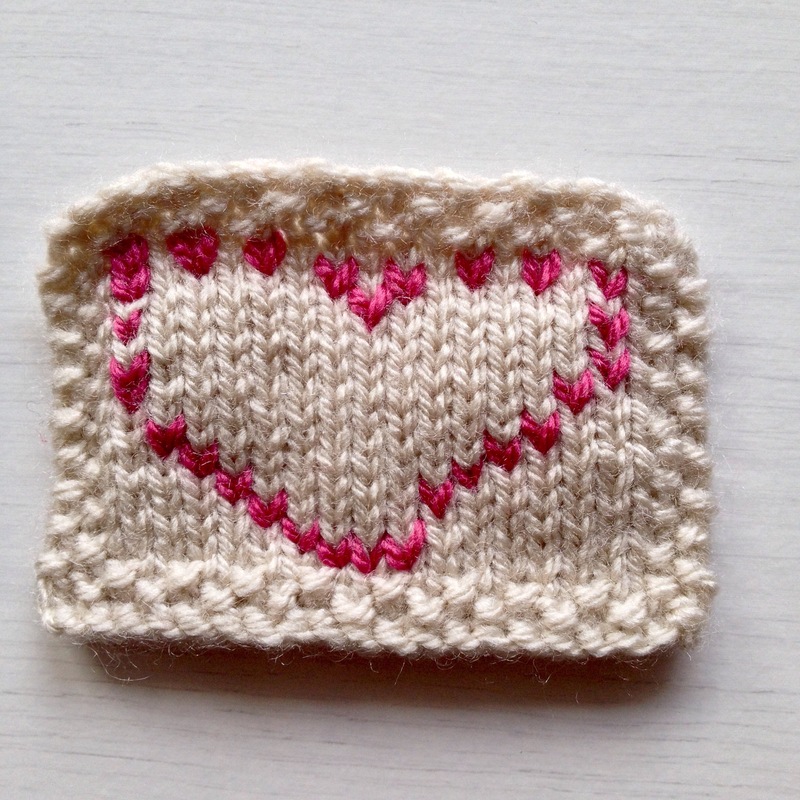 Alternatively you could just knit two rectangles, swiss darn the heart (or one on both sides) and sew or crochet them together, to turn them into a little woolly pincushion or a pointless but cute woolly thing. You’ll probably have even better ideas. If you do, please share them! 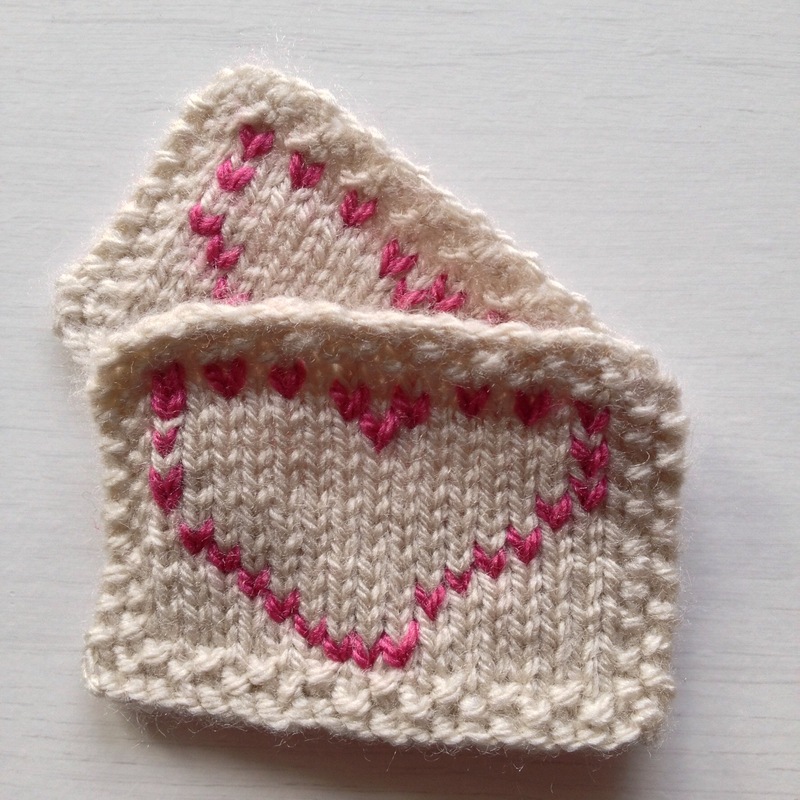 Yarn: I knitted these with Stylecraft Special DK scraps, in parchment and did the swiss darning in raspberry. You can use any DK you have. Needles: I used 3.5mm but use whatever you have or prefer. 4mm would work equally well and will still make a patch small enough to easily fit onto a card. 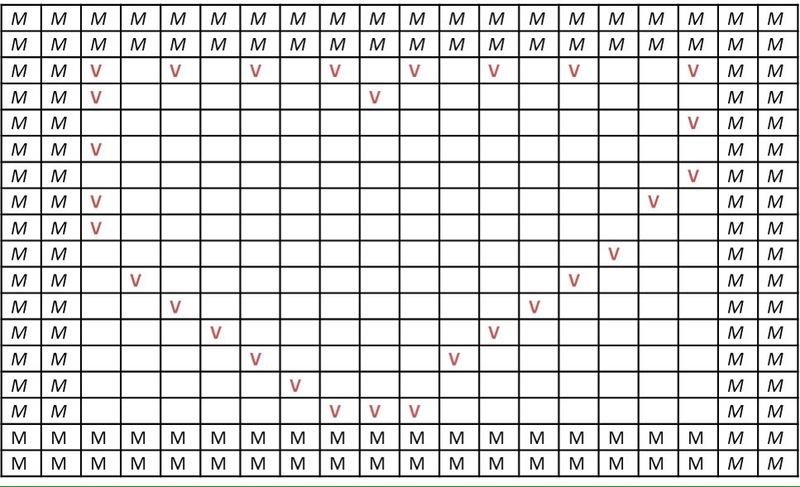 Repeat rows 3 & 4 6 more times. Swiss darning/duplicate stitch: decorate the patch with a contrast yarn. 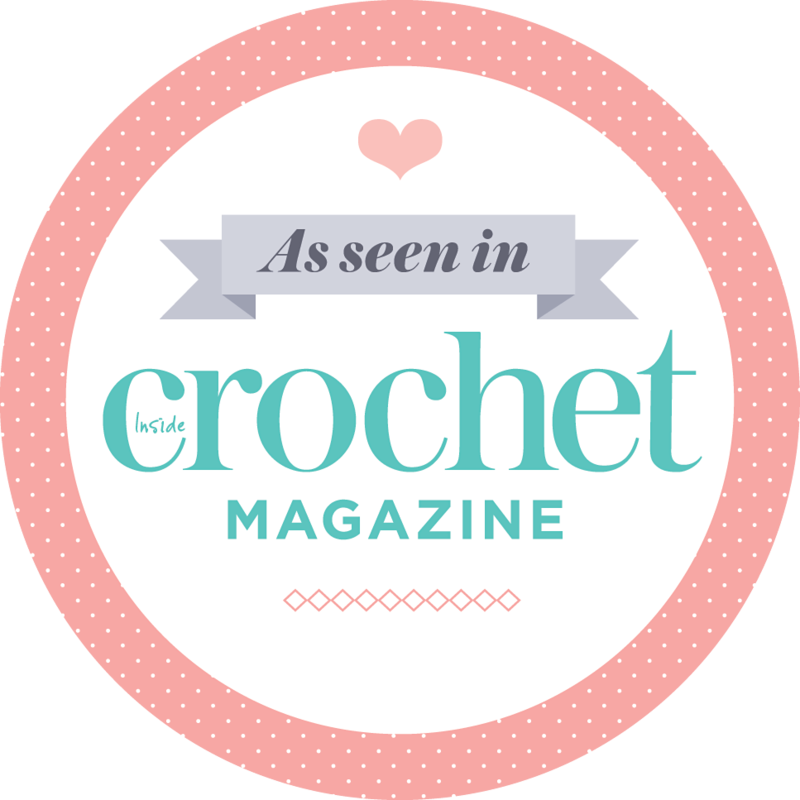 See this video from Simple Stylish Knitting if you’re unsure about how to do swiss darning. It’s easy once you get into the rhythm of it. Sew in a good source of light, so you can see what you’re doing properly. Both of my hearts are slightly different from each other. The main thing is to start at the top, and do the middle stitches first. Make sure the bottom stitches line up with those at the top. You can make the heart as wibbly or symmetrical as you like. It’s definitely homemade soup and toast weather at the moment especially with the threat promise of snow which hangs over each day at the moment. 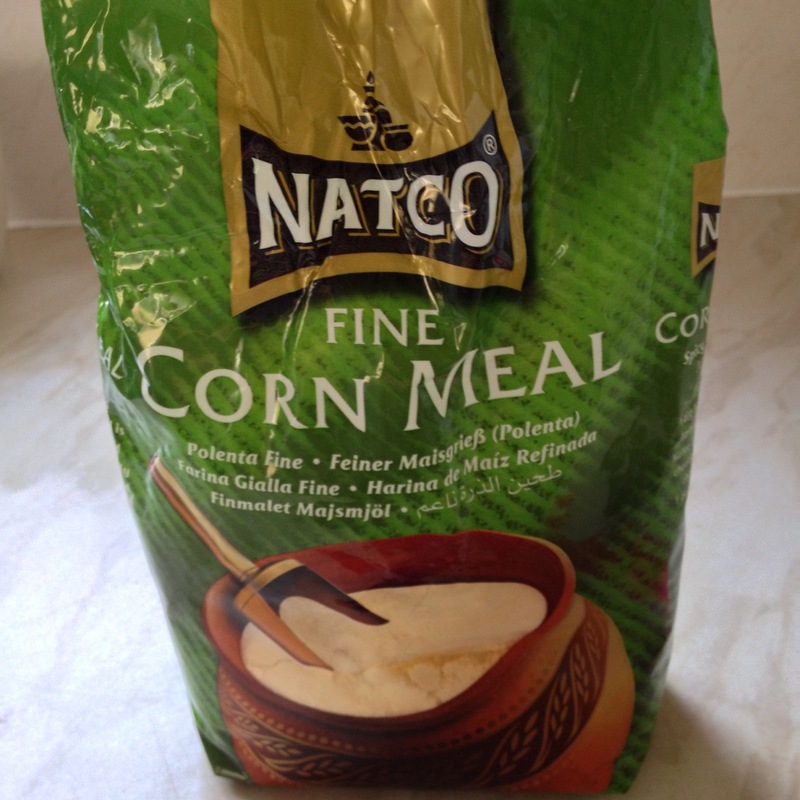 Back in the summer I bought this huge bag of cornmeal, aka polenta, to make a lemon polenta cake when we had guests here for lunch. 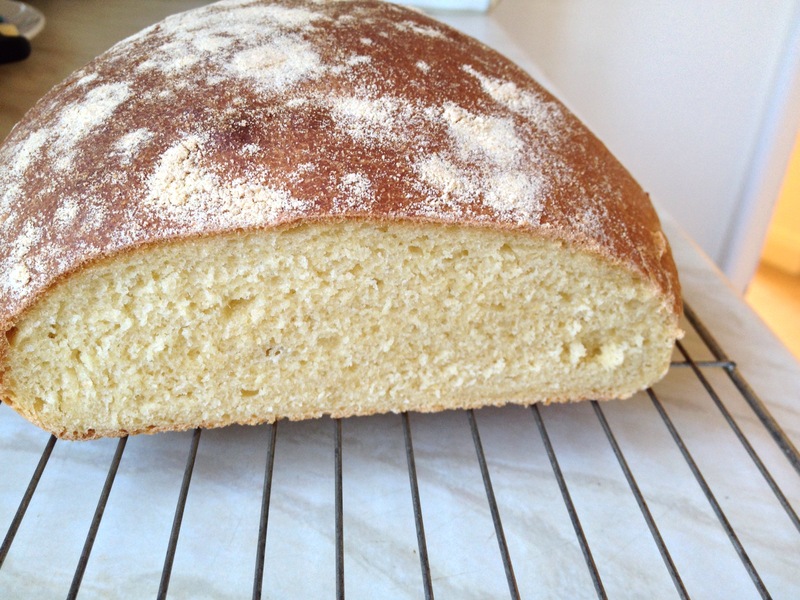 Since then it’s sat in the pantry neglected really, apart from the first time I tried this polenta bread recipe. Yesterday seemed the perfect opportunity to bake some more and I’m so glad I did as it’s really delicious. This is the bread recipe book I use most. I first borrowed a copy from the library to try a few recipes. This had such good reviews on Amazon UK, and I was still using recipes I’d photocopied, that it seemed daft to ask for any other book for my birthday last year. A good decision as I haven’t had a disappointing loaf yet! 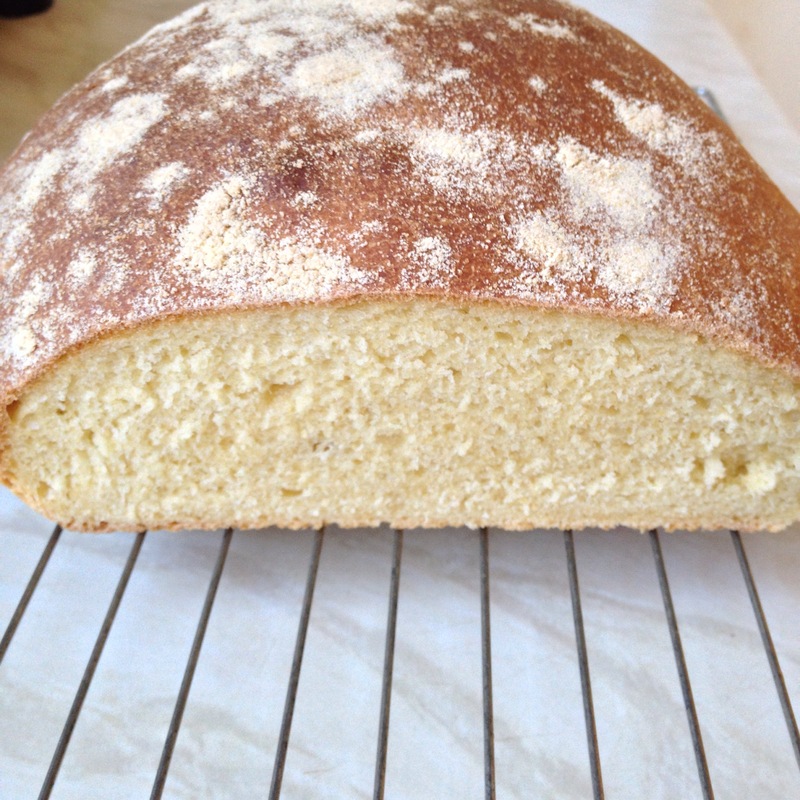 I thought I’d share the polenta bread recipe with you in case you have need for a soup and bread meal too. 1) Combine the flour, polenta, sugar, salt and yeast in a mixing bowl. Add the butter and water and mix to a soft dough. 2) Turn out onto a floured surface and knead for 8-10 minutes until smooth. Cover and prove in a warm place until doubled in size. 3) Grease a baking sheet and sprinkle with polenta. 4) Knock back the dough and shape into an 18cm (7″) long oval. Place on the baking sheet. Using a sharp knife, make deep cuts on alternate sides of the loaf. 5) Cover and prove until doubled in size. 7) Sprinkle liberally with polenta and bake for about 25 minutes until golden. Cool on a wire rack. 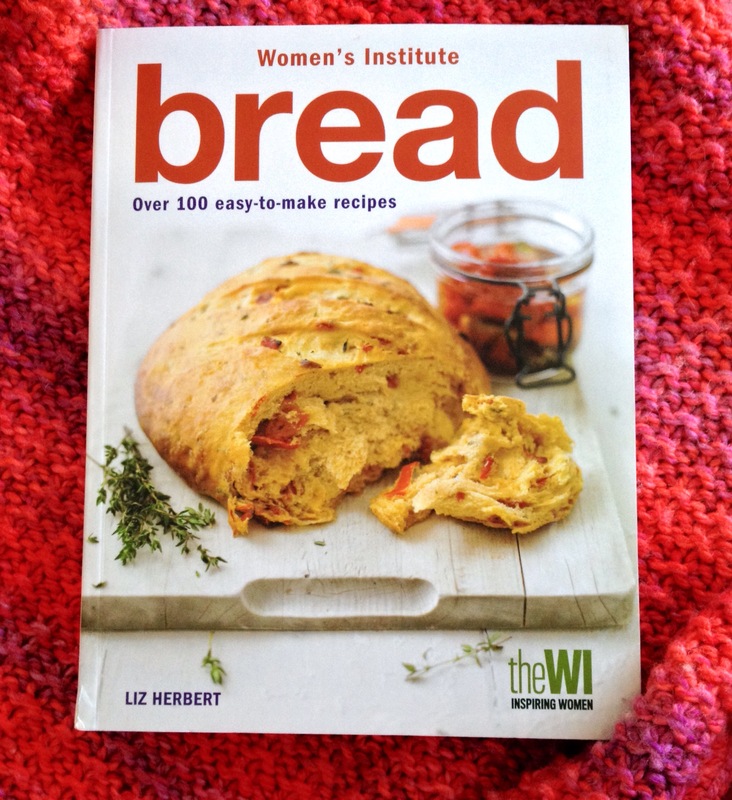 From Women’s Institute Bread: Over 100 Easy-to-Make Recipes by Liz Herbert. Polenta bread is best eaten fresh, when it’s moist and the knife slides through each slice as if it’s butter. It seems to go stale quite fast, but that’s no matter as it makes the crunchiest, tastiest toast. Perfect with chilli and lentil soup! Here’s the soup recipe. What are you enjoying cooking and eating at the moment? 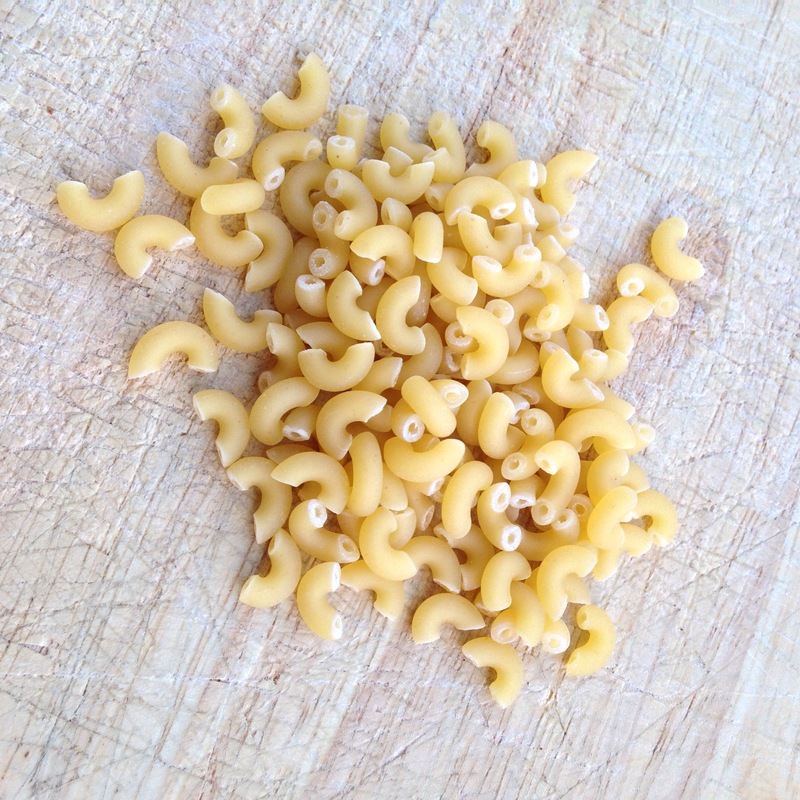 The other day I was looking in the pantry for pasta to go with my leftover puttanesca sauce (Recipe here from Nigella) and came across a bag of these little pasta shapes. They look macaroni sized, but are in fact much smaller, absolutely tiny. I bought them in a hypermarket in France last summer. This morning it was 5oc which is 2oc up on yesterday, but it’s a bitterly cold wind which blows. Time for soup. 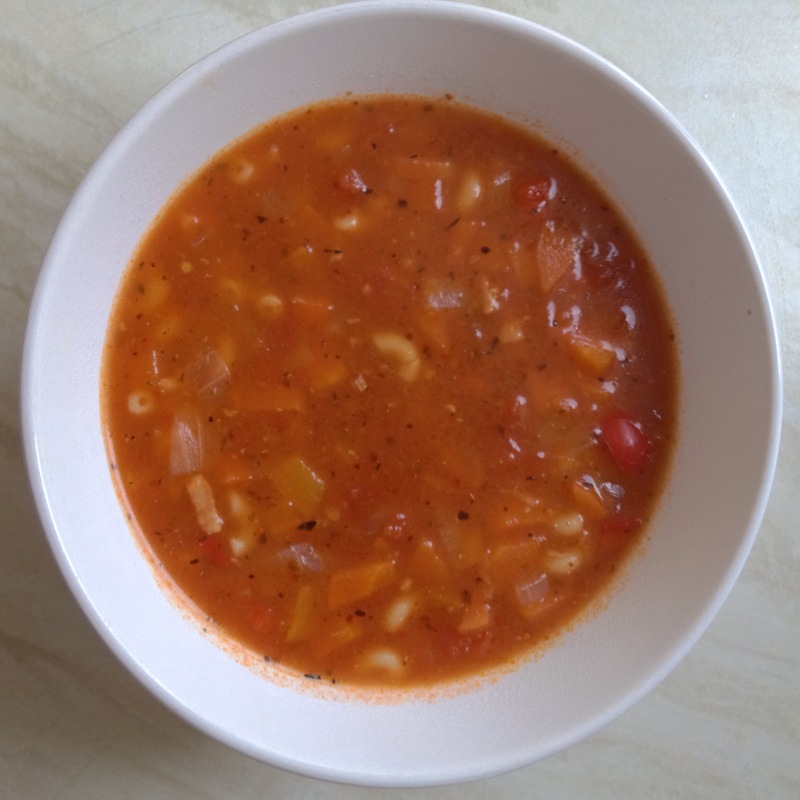 I had a good Goggle for minestrone recipes, but nothing really grabbed me so I made my own up as I went along. It turned out to be a corker. The Mister is away working in Stockholm this week and I do intend to save him a bowlful as a warming welcome home, but I’m not sure it’s going to last! He is texting about having rich and delicious moose meatballs for dinner. A couple of weeks ago he was in Toulouse and it was all cassoulet and sausages. Serves 4. Or 3 if you’re into really hearty bowlfuls! 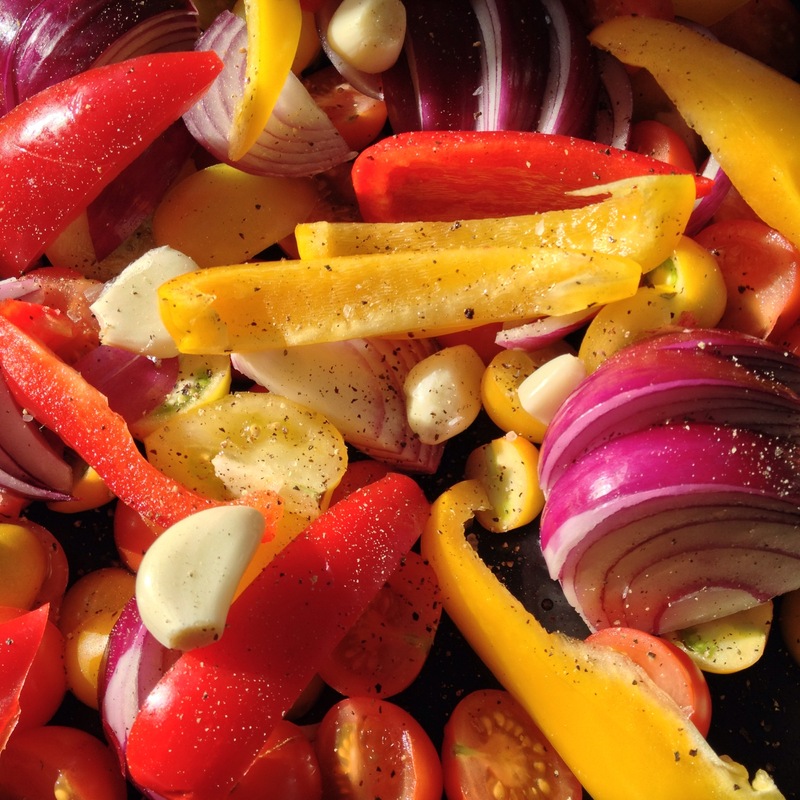 ::Heat oil in a large pan, cook onion till translucent, add rest of vegetables and cook slowly, covered, until softened. ::Add bacon and cook for a few minutes. Add smoked paprika and cook for a minute. ::Put rest of the ingredients into the pan and cook till vegetables tender. Stir now and then so it doesn’t stick to the bottom of the pan. Serve. Try not to go back for ‘just a little more’. Who needs Swedish meatballs or cassoulet? 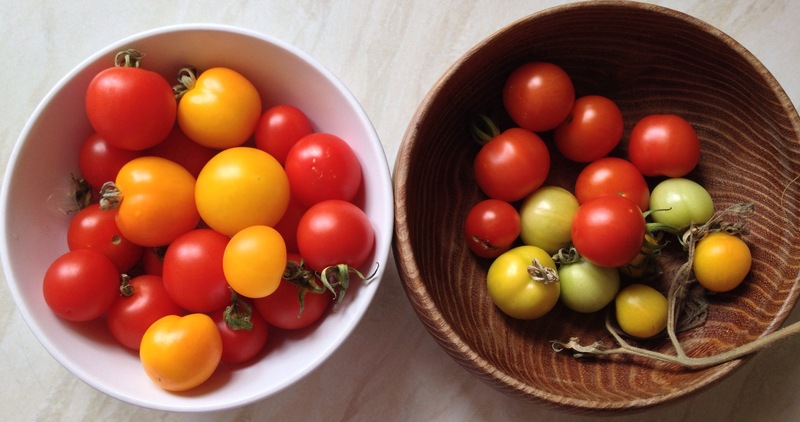 There are various bowls around the kitchen full of ripe and ready to eat tomatoes, alongside those still ripening. It’s fun deciding what to eat them with. 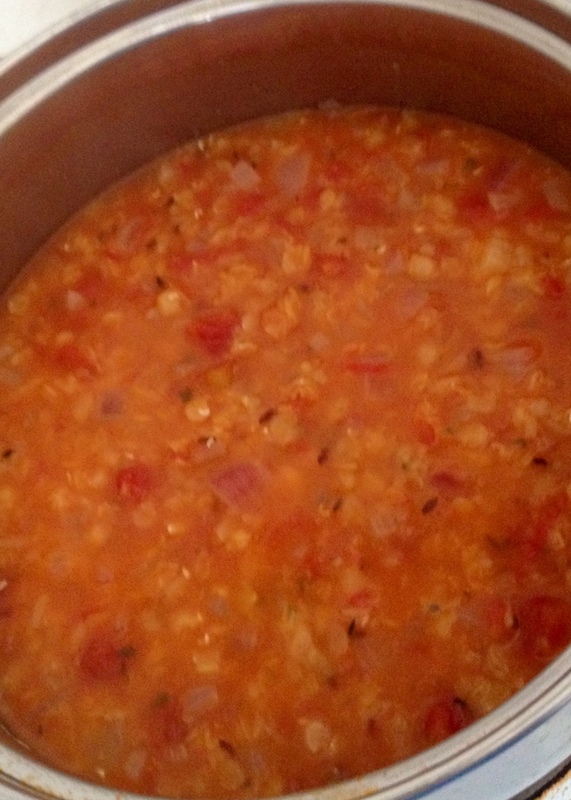 We had bacon and vegetable risotto with roasted tomatoes (simply cooked in the oven with a drizzle of olive oil, nothing else, they are so sweet) last night. 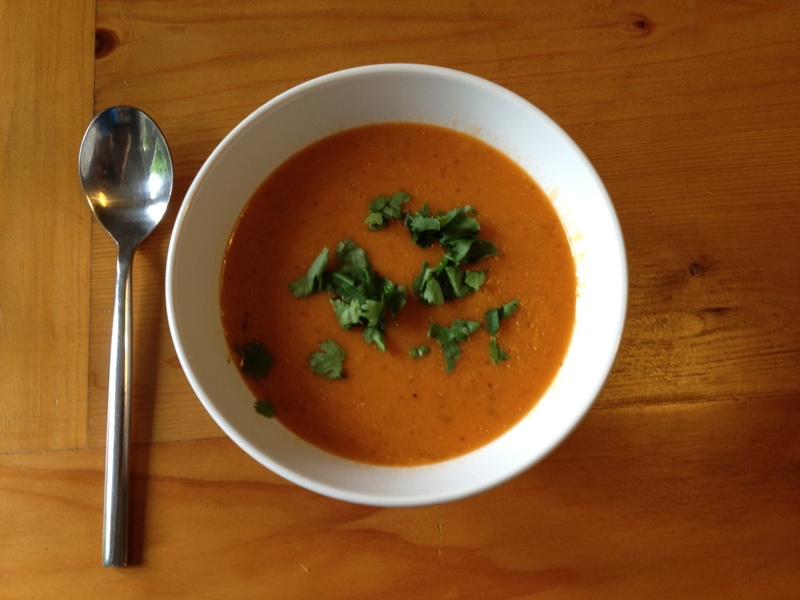 When I got up this morning I really fancied making a light summer soup for lunch. The temperature has dropped by about 10 degrees in the last few weeks, instead of a blissful 28 0c it’s now 17/18 0c at best and feels so cold! 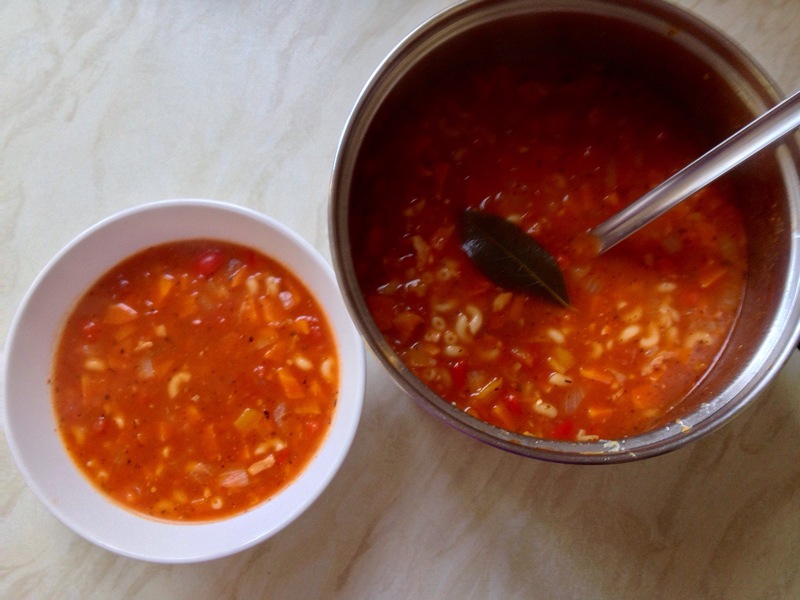 There are many versions of this soup floating around the net and I’ve made own version; using homemade garlic oil. I always have some on hand for when I’m feeling lazy and use it instead of fresh garlic, or if in this case, I want an extra garlicky kick to a dish. It’s easy: just add 3-4 peeled and halved garlic cloves into a glass jar or small bottle of olive oil and leave to steep for a few days. When it’s all used up I throw away the garlic, wash the bottle and begin again with fresh. I love all the bright colours. Don’t worry about the amount of garlic in the recipe, when it’s roasted garlic loses it’s stinkiness and just becomes rich and sweet in flavour. I’ve just opened the door for a delivery and the guy didn’t recoil when I breathed over him to sign for the box! 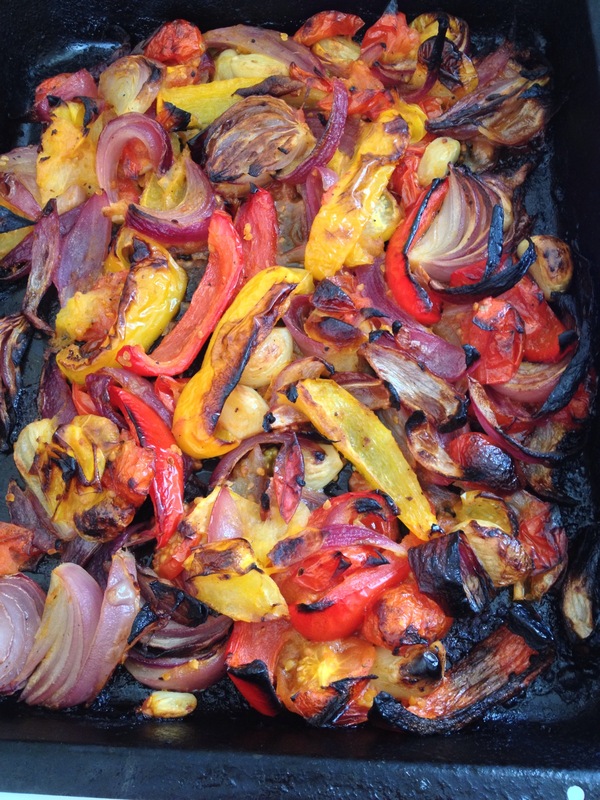 The tray of charred vegetables might not look like much, but they smelt delicious. 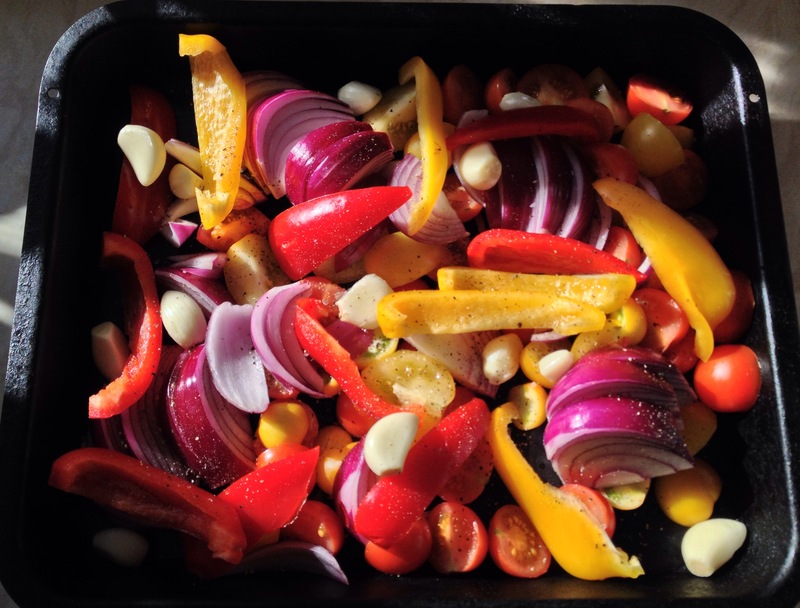 Ok, so this next bit might not seem a good advertisement; but if you do have a smoke alarm I’d recommend keeping the kitchen door closed while you’re roasting the vegetables. That’s a little tip I’ve learnt when I make my roasted butternut soup in the winter time! Make sure you scrape the roasting tray out well; you want to use every bit of caramelized vegetable that you can, to give the soup as much flavour as possible. 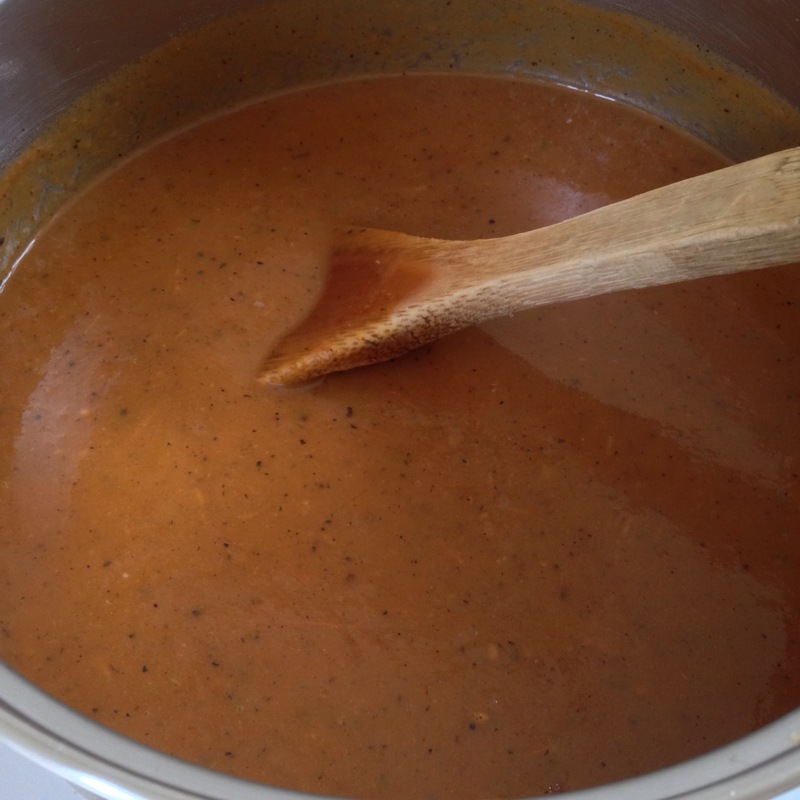 The black specks you see in the soup is ground black pepper. ::Roast for about 45 mins until the edges are charred. I gently turn them all over after 15 and then 30 minutes. The house fills with a delicious smell. If it’s tropical where you are (lucky things!) 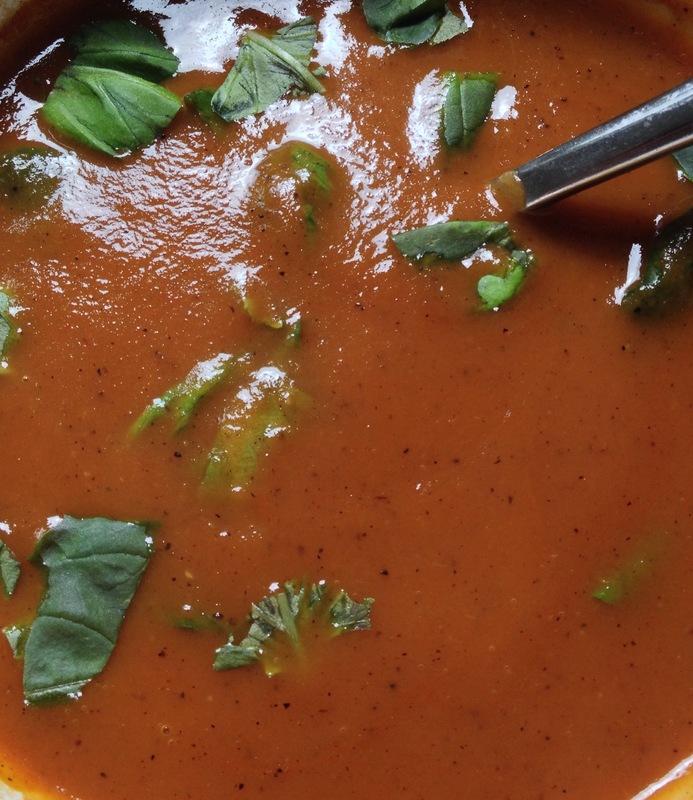 you can serve this summer soup well chilled with a few ice cubes in the soup.